During a recent discussion over on the HF Twitter page, I was informed to my surprise that the Sterling submachine gun had been added as a DLC weapon to Call of Duty WW2. I thought it would be interesting to take a look at the model used in the game and see how historically accurate it is. I recently finished writing a book about the Sterling and have done some research into the theories of the Patchett prototypes seeing some action during the war. The model that Sledgehammer Games, the developer, have used appears to be a mix of the early prototypes and the later production Sterlings. In terms of historical accuracy the gun should be correctly referred to as the Patchett Machine Carbine – after its designer George Patchett. It only began to be called the Sterling, after the company that manufactured it in the 1955. The model appears to share some similarities with the original Patchett prototype, including the step in the welded together receiver – the result of using left over Lanchester machine carbine receiver tubes, which was also built by Sterling. The position of the stock hinge point also appears to be in the correct place (it was later moved forward when the stock was modified). However, it appears to be feeding from a much later curved commercial pattern Sterling magazine (you can tell by the zigzag outline on the rear of the magazine and of course the curve – although seemingly not quite as curved as the real thing.) In reality the Patchett prototypes fed from Sten magazines, it wasn’t until after the war that Patchett designed his excellent 34-round magazine. Note how they even replicated the slanted brazed on rear sight that was added after the first trials. The game developers, however, added a metal guard tab just in front of the ejection port – something that wasn’t added until later and they also gave the gun markings on the magazine housing that mimic the later commercial Sterling markings. The game model also has the Sterling’s helical grooves on its breech block, something the early prototypes did not have. It seems the developers mashed together the Patchett prototype with later production Sterling L2A3/Mk4s. Did the Patchett See Action During WWII? While the early Patchett prototypes may have seen action in late 1944 – 1945 with one or two prototypes possibly making it into the hands of specialist troops there is no solid evidence to support this. 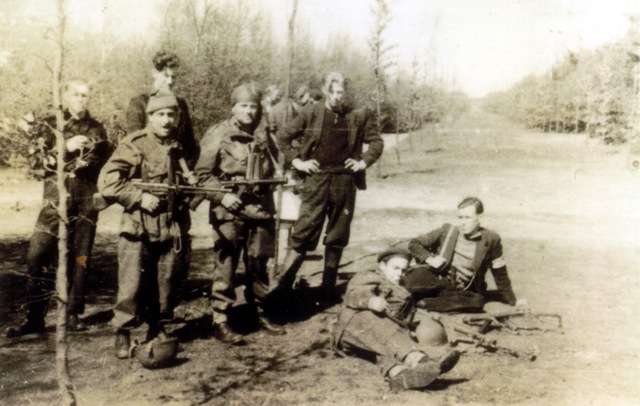 There is a tantalising grainy photograph of what is believed to be members of the Free French SAS on operations in the Netherlands in April 1945 (during Operation Amherst). The photo above shows what appear to be two Patchetts during a meeting with local resistance members. There is also an uncorroborated story that one prototype was carried by Lt.Col. Robert Dawson, officer commanding No.4 Commando, during Operation Infatuate but there is no documentary evidence to support this. I discuss these and several other pieces of evidence that support the idea that the Patchett/Sterling saw action in my new book on the Sterling. Posted on December 18, 2018 December 18, 2018 by TABPosted in Blog, VideoTagged Call of Duty, COD, COD: WWII, Gaming, History, Matt, Patchett Machine Carbine, Prototype, SMG, Sterling, Submachine Gun, Video, Video Games.